This week JF and I picked 3 large baskets of strawberries. They were extremely ripe, so the rest of the week was a marathon of preserving, baking and eating before they went bad! 1. frozen - on a cookie sheet until firm and then in a container. I'm not sure what I'll do with these later on, jam or baking I suppose, as the berries will be mushy. 2. dehydrated - the flavour becomes so concentrated, it's delicious! I can't wait to have this mid-winter in oatmeal or granola. I preferred the look of mandolin sliced berries as opposed to halved berries. 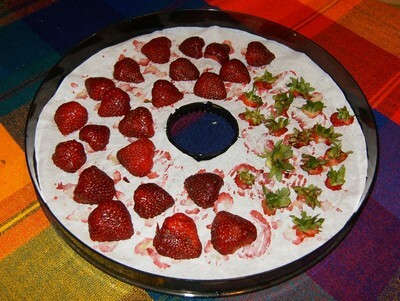 2.5 - we dehydrated the strawberry hulls as well, for use later on making strawberry tea (good hot or cold!). Caution: Strawberry leaves must be thoroughly dried or completely fresh in order to be edible. 3. Jam! - we successfully reached gel point in our first ever jam making. I've got strawberries macerating for a second batch of jam, this time vanilla strawberry. Mmm! What are your favorite ways to preserve strawberries?